Stunning new long-player from Essex hitmakers The Windmills contains eleven of the strongest songs the band has recorded to date. 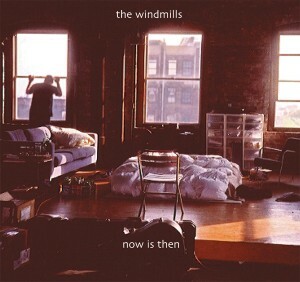 Following the critical success of their previous album "Sunlight" and inaugural live dates in the US, The Windmills spent the greater part of a year writing and recording the songs for this third album. Perfectly mixing new pop classics like "Summer Snow," "Beach Girls 1918" and "Something Spring" with mature, tragic songs "Your Fingers and Mine" and "Ever To Exist" and the extraordinary title track - a tightly strummed guitar pop masterpiece that recalls the best of The Wedding Present - The Windmills have hit on something truly magic. Glittering guitar pop with intelligent lyrics and wonderfully warm vocals that places them in the same league as the bands to which they are frequently compared: Go-Betweens, East Village, and The Smiths. If you were tuned into The Windmills from previous releases then you undoubtedly have this on your shopping list already, but if not, make this your first stop. "Now Is Then" is the band's defining moment and the gauge against which all future releases will be judged.